This delightful disc offers a selection from the wealth of piano transcriptions of Bach's music. The Bach revival that gathered momentum during the nineteenth century created a climate for many composer-pianists to interpret his works through their own piano transcriptions, whether of chorale preludes, organ works or other instrumental music. Much of Bach's music was made domestically available via such arrangements (and the tradition continued well into the twentieth century, even after Bach originals were well known). Indeed, the practice of such transcriptions was widely used by Bach himself, who freely adapted his own and others' music for different instrumental settings. One of today's finest Bach pianists, Angela Hewitt concentrates primarily on those arrangements of Bach that keep pianistic elaboration and virtuosity in proportion: whatever instrument his music is played on, Bach should still sound like Bach. Eugen d'Albert's magnificent transcription of the C minor Passacaglia and Fugue for organ, BWV582, is included, as are five beautiful transcriptions by Wilhelm Kempff, and a number of arrangements by English composers that were included in A Bach Book for Harriet Cohen (a collection compiled for the pianist Harriet Cohen, who knew many English composers of the early twentieth century). Angela Hewitt also includes three transcriptions of her own. 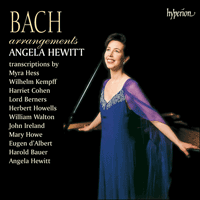 A fascinating companion to Angela Hewitt's acclaimed Bach recordings for Hyperion, this ravishing disc will appeal to lovers of Bach as much as connoisseurs of the piano. On 11 March 1829 the twenty-year-old Felix Mendelssohn conducted Johann Sebastian Bach’s St Matthew Passion in Berlin. For this, the first performance of the work in the seventy-nine years since Bach’s death, he had rehearsed the choir of 158 singers and a full-sized modern orchestra (which he conducted from the piano, it seems by heart) for well over a year. The Berlin Singakademie was filled to the rafters and, according to his sister Fanny, an air of ‘solemn devotion’ pervaded the whole. It was hardly an ‘authentic’ performance in today’s terms, with Mendelssohn making huge cuts, changing the scoring of many passages, and re-assigning several solo parts in order to use singers from the Royal Opera. Nobody, however, complained about any of that. It was a revelation to all, and fulfilled the promise of the editor of the Allgemeine musikalische Zeitung, A B Marx, that it would ‘open the gates of a long-closed temple’. The point was not to get as close as possible to Bach’s intentions, but to bring his music to life in a way that would be understood by nineteenth-century audiences. Mendelssohn did the same, evidently, in his interpretation of Bach’s Chromatic Fantasy and Fugue, ‘playing it with all possible crescendos, and pianos, and fortissimos, pedal of course, and doubling the octaves in the bass’. What would Johann Sebastian have thought of that? Not only did this event act as a huge stimulus to other performances of pre-Classical music (Brahms was also part of the revival, conducting a large amount of early choral music while in Detmold and Vienna), but it heavily influenced composition in the nineteenth century. Mendelssohn wrote six Preludes and Fugues for piano (Op 35), Schumann several for pedal piano, Liszt composed his variations on Bach’s Weinen, Klagen, Sorgen, Zagen, Grieg wrote his suite ‘From Holberg’s Time’, and so the list goes on. Composer-pianists also began making their own arrangements of Bach’s works and including them in their recital programmes (much more so than the real thing which, as Wanda Landowska suggests, they must have found a bit bare). First and foremost of these was Ferruccio Busoni (1866–1924), who published eight volumes of his own Bach edition, including many transcriptions, and who considered Bach to be ‘the foundation of piano playing’. Franz Liszt, too, transcribed six of the big organ works to great effect. If there were objections, they would defend themselves saying that Bach and his contemporaries pinched music from each other all the time, and recycled works when it suited them. By bringing music of the past to the masses, they were doing the composers a service, even if it was in their own fashion. Not all composers agreed, however. Much later on, Hindemith stated in his book A Composer’s World (1952) that he considered the art of transcription on a level with ‘providing a nice painted skirt and jacket for the Venus de Milo’. Nowadays, at the beginning of the twenty-first century and after the huge early music revival and its preoccupation with ‘authenticity’, it is still possible to present such transcriptions and awaken interest in many a listener to a work previously unknown to them (or indeed shed a different light on music generally familiar). They will be cherished as long as performers, amateur or professional, want the challenge of playing something on an instrument for which it wasn’t originally conceived (and, in the case of Bach and the piano, is very different from the instrument known to the composer) simply to say in their own way how beautiful, wondrous, or monumental a certain work may be, and to share their enthusiasm for it. Such is the case with the five transcriptions by the German pianist, Wilhelm Kempff (1895–1991) which open this recording. Born into a family of organists, he began playing the ‘king of instruments’ before he could reach the pedals, and by the age of ten could play and transpose all of the 48 preludes and fugues from The Well-Tempered Clavier. As his father was also a choral conductor, he got to know all the cantatas while still in his childhood, conducting many of them himself in later years. He put together these Bach transcriptions in the 1910s and 1920s, largely inspired by Busoni’s performances in Berlin during his youth. He spoke of the latter’s ‘spiritualized sound’, a quality which is certainly present in Kempff’s own transcriptions recording made in 1975. For him, the piano was both organ and orchestra, and could produce sonorities to match either. This is marvellously illustrated in the opening piece, the Sinfonia in D major from the Ratswahl­kantate, BWV29 (‘Wir danken dir, Gott, wir danken dir’ / ‘We thank you, God, we thank you’) – a work written by Bach in 1731 for the election of Leipzig city council. The original is a brilliant movement for organ solo and orchestra (complete with trumpets and drums), which is Bach’s own reworking of the first movement of the Partita in E major for unaccompanied violin, BWV1006. It was after Kempff had played the original obbligato organ part on the piano at a concert in Berlin conducted by another famous Bach pianist, Edwin Fischer, that he decided to replicate the sound of the orchestra in his own transcription for piano. This it certainly does! Kempff marked it ‘Allegro pomposo’, and inserted the word ‘glorioso’ at the first big build-up before the long decrescendo. It remained one of his favourite encores throughout his career. The only transcription in this recording that does not originate from a cantata or an organ work by Bach is the touching Siciliano in G minor. It is in fact the second movement of the Sonata in E flat major for flute and harpsichord, BWV1031, whose theme is tender and haunting. The work was probably written in 1741 for the concerts of Leipzig’s Collegium Musicum which Bach directed. Kempff’s transcription is dedicated to Albert Schweitzer, the eminent Bach biographer and organist, but also a theologian, philosopher and medical missionary. At the centre of Bach’s musical heritage was the chorale – a communal song of faith that played a significant part in the Protestant church. Martin Luther once declared: ‘Music is a gift of God. It removes from the heart the weight of sorrow and the fascination of evil thoughts.’ Their healing power was all the more for being sung by the entire congregation, joining together in their praise of the Almighty. It is significant that chorale preludes for organ were among Bach’s earliest compositions, and were with him on his deathbed when he is said to have dictated ‘Before thy throne I stand’ to a pupil. He wrote nearly a hundred of them, most of which are grouped in different collections. Jacob Adlung, a German organist of the time, described the three purposes for chorale preludes: first, to prepare the congregation for the key; second, to inform them of the tune; and third, to delight them through fluent ideas (durch wohlfiessende Gedanken). Without a doubt, Bach was most interested in the third possibility. This is probably what annoyed, rather than delighted, the Church authorities in Arnstadt, his first professional posting, when they scolded him ‘for having made many curious variationes in the chorale, and mingled many strange tones in it, and for the fact that the congregation has been confused by it’. Bach wasn’t to be stopped in his tracks, so instead moved on to a more enlightened town. She wakens and with speed arises. His light is bright, his star surprises. The Lord’s own Supper there to share! Transcriptions are often awkward to play because of their very nature, and this one demands that the counter-melody be played by the outer, weaker fingers of the right hand. Kempff talked about the importance of a true legato (necessary for any good Bach playing), and it is just as important in his transcriptions as in the ‘real’ Bach. The most famous collection of organ chorale preludes by Bach is the Orgelbüchlein (‘Little Organ Book’) which he probably composed in Weimar between 1713 and 1716. Originally envisaged as a volume of 164 pieces (he began by ruling up 182 pages and inserting the titles), he completed only 45 – why, we don’t exactly know. What Bach did achieve in this collection, however, was a new form of chorale prelude where the melody of the hymn was played, usually in the upper voice, sometimes but not always embellished, with the thematic motives of the accompanying voices somehow related to the emotional or theological content. We know from a title-page that Bach added later on that they were also meant as teaching material with special emphasis on developing pedal technique. For this recording I have chosen five of the chorale preludes from the Orgelbüchlein – all of which are gems. Laß mich doch nicht verzagen. O hear my sore complaining! thine ear to me inclining! And keep Thy word e’er holy. Recitative: Shall Pales be the last to offer a sacrifice? No! No! I would also forsake my duties, and as the whole sovereignty rings with cheers, let even my beautiful pastures honour the hero of Saxony with me, to bring him joy and happiness. Aria: Sheep may safely graze where a caring shepherd guards them. Where a regent reigns well, we may have security and peace and things that let a country prosper. It is scored for soprano, two flutes, and continuo. So much for the original. The excellent transcription is by the American composer, Mary Howe (1882–1964). Born in Richmond, Virginia, she studied both piano and composition at the Peabody Conservatory in Baltimore, and was for a short time in the 1930s with Nadia Boulanger in Paris. She was a founder of the National Symphony Orchestra in Washington, D.C., and along with Amy Beach helped organize the Society of American Women Composers in 1925. This piece is one of my favourite encores. The ability to translate spirituality into sound at the keyboard is certainly necessary here – otherwise such a famous tune sounds banal and hackneyed. Besides Hess’s own, there have been other famous pianists’ recordings of this transcription including those by Lipatti and Gieseking, while Kempff recorded his own arrangement. Um Rettung aus der Angst und Noth. For rescue from our misery. As in all three of my transcriptions, I have stayed extremely close to the original, simply doubling the pedal part, and occasionally moving a voice to another octave if need be. This chorale prelude is an arabesque – a florid, serene melody which, after staying within a fairly small range, soars upwards in the second last phrase, mirroring the words ‘And cry, O faithful God, to Thee’. The accompaniment constantly refers to the first four notes of the hymn tune. Bewahrt hast lange Zeit und Jahr. When danger and distress were near. At this time  Oxford University Press were negotiating an exciting new project with me. Several composers, knowing of my special devotion to Bach, transcribed some of his works for organ, song or strings, so that I could play them to myself. One told the other about it until I had about ten arrangements. Oxford Press heard about these ‘acts of homage’ and decided to publish them – if such a difficult project could be arranged. Elgar told me he’d try his best to do one, but in the event this did not materialize. Holst couldn’t find anything he wanted to arrange, and anyway didn’t feel that he could tackle the piano. I had written to Vaughan Williams to transcribe something for me, offering many more kisses although I owed him a lot from the Hymn-Tune. He answered: ‘How can I say “no” – when such a reward will be mine if I say “yes”? I shall claim it to the full (and the 1580th).’ His and ones from Bantock, Bax, Ireland, Bliss, Berners, Bridge, Howells, Goossens, Lambert, Walton and Whittaker finally arrived; everything was amicably decided and the title of the album would be – A Bach Book for Harriet Cohen. This collection of arrangements from Bach’s music is intended by the adaptors as a tribute to the executant who has done more than any other to further the cause of British piano and concerted music, both here and abroad. Miss Cohen has, indeed, given first performances of works by no fewer than seven of the English composers concerned in this compilation. She has always been an intense enthusiast for the music of Bach (not alone of his keyboard writings), and her composer friends considered that a collection such as this would furnish an opportunity of providing her with accessible piano versions of certain fine things originally composed for the organ, voice, or some orchestral combination. George Bernard Shaw, a close friend of Harriet Cohen, nicknamed it ‘Five-finger Exercises for Harriet by Infatuated Celebrities’ (Cohen was in fact the mistress of Arnold Bax). Not all the pieces are on the same level of inspiration. From the original twelve, I have chosen four to include in this recording. Nun singet und seyd froh! For me, the gem of this Bach Book is the transcription by Herbert Howells (1892–1983) of O Mensch, bewein dein Sünde gross, BWV622, an organ chorale prelude for Passiontide taken from the Orgelbüchlein. Once again, he adheres very closely to the original (I have added a few things from the latter which he unaccountably leaves out), but in so doing creates a work for piano which is totally suited to that instrument, though very difficult to play well. Bach’s harmonic progressions here are amazing. In fact, anyone not familiar with the original would probably think that Howells had added quite a bit! The words (Sebald Heyden, 1525) are beautifully portrayed with the almost constant use of a four-note descending figure (which ascends as well) underneath an elaborate solo melody. Upon the cross, long suff’ring. No doubt Bach’s friends and pupils thought ‘Das alte Jahr vergangen ist’ and ‘O Mench, bewein’ dein’ Sünde gross’ very fine things, but I make bold to say that they had no such idea of the wonderfulness of them as we have who have been through ‘Tristan’. The developments of poetic music in the 19th century, in the opera, the symphonic poem, and the song, have sharpened our senses for the poetry of Bach. This chorale was also used as the basis for a huge fantasia ending the first part of the St Matthew Passion (which in turn was taken from the second version of the St John Passion). The original tune was written by Mathias Greitter in 1525. And thought may give to thee. Cohen’s own recording of this transcription includes a massive rallentando at the end which I have tempered slightly. Harold Bauer (1873–1951) was born in Kingston-on-Thames and received his first musical training on the violin. It was only much later that he decided to switch to the piano (after being persuaded by Paderewski who praised his beautiful tone, adding, ‘besides, you have such beautiful hair’!). In 1893 he went to Paris where he stayed for twenty years (and became the dedicatee of Ravel’s Ondine). In 1900 he made his American debut giving the Boston premiere of Brahms’s First Piano Concerto with the Boston Symphony. He was considered one of the greatest pianists of his time, and a true successor to the tradition of Liszt, Paderewski and Brahms. His legendary Bach recitals in London in the 1920s introduced many listeners to the music of the German master. For the publishing house Schirmer he made many editions, including several of the works of Bach. when buried deep my body lies. for I will wake beyond the skies. As is the case with Howells’s transcription of ‘O Mensch, bewein’, the harmonies that really surprise us are pure Bach – not modern additions. The contrasting middle section in the major key introduces the strings playing pizzicato and the ‘death knells’ of the text. Where we most see the romantic influence of this arrangement is in Bauer’s treatment of the da capo, where he makes a bridge of truly Brahmsian character back to the beginning (and then makes a cut in the original). No one can say, however, that he doesn’t beautifully capture the poignant sadness of this extraordinary aria. Unfortunately I studied for a considerable period in that land of fogs, but during that time I learned absolutely nothing; indeed, had I remained there much longer, I should have gone to utter ruin … only since I left that barbarous land have I begun to live. And I live now for the unique, true, glorious, German art. His life was tempestuous (six wives), his career as a virtuoso short due to his greater interest in composition. His transcription of one of Bach’s greatest organ works, the Passacaglia in C minor, BWV582 shows what a flair he must have had at the keyboard, and why Liszt called him a ‘second Tausig’ and ‘our young lion’. He does manage, nevertheless, to stay remarkably close to the original, even if his frequent change of dynamics and tempi are very much of their time. I find his articulations and phrasing very close to what I would imagine Bach wanted, and the overall ‘editing’ of the work very convincing. I have changed a few things to be closer to Bach rather than d’Albert (beginning the trills from the upper note, for instance! ), but these are minor adjustments. So much for d’Albert. What is Bach saying in this piece? A passacaglia is a set of variations over a ground bass (constantly repeating itself). The first half of the theme Bach uses for this one was borrowed from a passacaglia by the French composer André Raison (1650–1720). The twenty variations and fugue which follow are grouped so as to provide points of maximum tension and release. There is some discussion as to whether or not it was originally intended for a two-manual pedal harpsichord rather than the organ, which I think is plausible. Recent research also dates the work to Bach’s time in Arnstadt (1703–1707) when he was clearly influenced by his hearing Buxtehude in Lübeck. The fugue is not a separate entity but rather an integral part of the passacaglia, using the first part of the theme as its subject, along with a persistent countersubject that greatly adds to the culminating excitement. It is refreshing to hear the passacaglia theme break out in different keys rather than simply restating it in the tonic as was the case in the variations. In the last few lines the music comes to a brief halt on a Neapolitan sixth chord (D flat major). As Peter Williams says: ‘Even a Neapolitan sixth can never sound as well as it does at the end of this fugue; theoretically the effect is ordinary, but in its context the chord is magnificent.’ I’m not surprised that d’Albert chose to transcribe this particular work, as I’m sure he had the drama and power to match. Le 11 mars 1829, Félix Mendelssohn dirigeait la Passion selon Saint-Matthieu de Jean Sébastien Bach à Berlin. Il n’avait que 20 ans. Pour mener à bien cet immense projet, en donner la première exécution depuis la mort de Bach, soixante-dix-sept ans de cela, il avait fait répéter un chœur de 158 chanteurs et un orchestre symphonique moderne complet (qu’il dirigea par cœur du piano, semble-t-il) pendant plus d’un an. La Singakademie de Berlin était comble et selon sa sœur Fanny était parcourue par une atmosphère de «dévotion solennelle». En regard des critères actuels, cette exécution n’était guère «authentique» puisque Mendelssohn effectua d’importantes coupes, changea l’orchestration de nombreux passages et réassigna plusieurs parties de solistes afin d’utiliser les chanteurs de l’Opéra royal. Personne ne songea pourtant à s’en plaindre. En fait, ce fut une révélation pour tous. Les attentes du rédacteur de Allegemeine musikalische Zeitung, A B Marx, étaient comblées, car selon lui ce moment «ouvrit les portes d’un temple longtemps fermé». L’important n’était pas de demeurer aussi proche que possible des intentions de Bach, mais d’animer cette musique d’une manière qui serait comprise par le public du XIXe siècle. A l’évidence, Mendelssohn fit la même chose pour son interprétation de la Fantaisie chromatique et fugue de Bach «la jouant avec tout ce qui était possible de crescendos et pianos et de fortissimos, des pédales bien entendu, et doublant les octaves à la basse». On se prend à se demander ce que Johann Sébastian aurait bien pu penser de tout cela? Cet événement n’exerça pas seulement un stimulus énorme sur les autres exécutions du répertoire préclassique (Brahms participa également à ce renouveau, dirigeant maintes œuvres chorales durant les périodes passées à Detmold et Vienne), mais il influença profondément la composition du XIXe siècle. Mendelssohn écrivit six Préludes et Fugues pour piano, opus 35, Schumann en consacra plusieurs pour piano avec pédalier, Liszt composa des variations sur Weinen, Klagen, Sorgen, Zagen de Bach, Grieg sa suite «Holberg» et la liste est longue. Les pianistes-compositeurs commencèrent à réaliser leur propre arrangement des œuvres de Bach afin de les incorporer à leurs récitals (bien plus que les originaux, qu’ils ont dû trouver dépouillés comme le suggère Wanda Landowska). Au premier rang de ces personnalités figurait Ferruccio Busoni (1866–1924) qui fit paraître huit volumes de ses propres éditions de Bach incorporant de nombreuses transcriptions de son cru. Busoni estimait qu’en Bach reposait «la fondation du jeu du piano». Franz Liszt transcrivit également six de ses grandes œuvres pour orgue avec un superbe effet. Face aux quelques objections soulevées, ces pianistes-compositeurs se défendaient en disant que Bach et ses contemporains s’appropriaient constamment la musique des uns et des autres et qu’ils recyclaient même leurs œuvres quand le besoin s’en faisait sentir. En rendant la musique du passé accessible aux masses, ils leur prêtaient main forte à leur manière. Cette opinion n’était pourtant pas partagée par tous les compositeurs. Bien plus tard, Hindemith s’élevait dans A Composer’s World (1952) contre l’art de la transcription qu’il considérait d’un niveau comparable à celui qui offrirait «à la Vénus de Milo une jupe et une veste délicieusement peintes». En ce début de XXIe siècle, après l’immense renouveau qu’a connu la musique ancienne secondée par son goût de «l’authenticité», les conditions demeurent toujours réunies pour présenter de telles transcriptions au public et éveiller l’intérêt de ceux inaccoutumés à ce répertoire (ou pour jeter un regard nouveau sur une musique familière). Ces transcriptions seront appréciées aussi longtemps que des musiciens, amateurs ou professionnels, souhaiteront se mesurer à leur exécution sur un instrument pour lequel elles n’étaient pas originalement conçues (et, dans le cas de Bach et du piano, très différent de celui que le compositeur connaissait) afin de simplement dire à leur manière à quel point telle ou telle œuvre peut être magnifique, merveilleuse et monumentale, afin de partager l’enthousiasme qu’ils éprouvent à son égard. Ainsi en est-il des cinq transcriptions du pianiste allemand Wilhelm Kempff (1895–1991) qui inaugurent le programme de ce disque. Né au sein d’une famille d’organiste, Wilhelm Kempff commença à jouer du «roi des instruments» avant de pouvoir atteindre le pédalier. A dix ans, il pouvait jouer et transposer les 48 Préludes et Fugues du Clavier bien tempéré. Grâce aux activités chorales de son père qui était aussi chef de chœur, il se familiarisa de bonne heure avec les cantates qu’il dirigea lui-même plus tard dans sa vie. Kempff réalisa ces transcriptions de Bach dans les années 1910 et 1920 en s’inspirant largement de Busoni qu’il avait entendu jouer à Berlin dans sa jeunesse. Par la suite, il évoquait la «sonorité spiritualisée» de ce dernier, une qualité certainement présente dans l’enregistrement que Kempff grava en 1975 de ces propres transcriptions. Pour lui, le piano était à la fois orgue et orchestre et il parvenait à réaliser des sonorités correspondant aux deux. Cet aspect est illustré à merveille dans la première œuvre, la Sinfonia en ré majeur du Ratswahlkantate, BWV29 (Wir danken dir, Gott, wir danken dir) («Nous te remercions, Dieu, nous te remercions») – une page que Bach écrivit en 1731 lors de l’élection du Conseil municipal de Leipzig. La partition originale est un brillant mouvement pour orgue seul et orchestre (avec trompettes et percussions), lui-même une version remaniée du premier mouvement de la Partita en mi majeur pour violon seul, BWV1006. Ce n’est qu’après avoir donné un concert à Berlin sous la direction d’Edwin Fischer, un autre pianiste de renom féru de Bach, où il exécutait au piano la partie obligée originalement pour orgue qu’il se décida à reproduire également la sonorité orchestrale à travers sa propre transcription pour piano. Et il y est bel et bien parvenu! Kempff indiqua «Allegro pomposo» et inséra le mot «glorioso» lors du premier grand élan paroxysmique avant le long decrescendo. Durant toute sa carrière, cette page demeura une de ses préférées. La touchante Siciliano en sol mineur est la seule transcription au programme de ce disque qui ne trouve pas son origine dans une cantate ou une œuvre pour orgue de Bach. Il s’agit en fait du second mouvement de la Sonate en mi bémol majeur pour flûte et clavecin, BWV1031 dont le thème est tendre et soupriant. Cette œuvre vit probablement le jour en 1741 pour les concerts du Collegium Musicum de Leipzig que Bach dirigea. La transcription de Kempff est dédiée à Albert Schweitzer, l’éminent biographe et organiste de Bach qui fut également un grand théologien, philosophe et missionnaire médical. Au cœur de l’héritage musical de Bach figure le choral – un acte de foi chanté collectivement qui jouait un rôle crucial au sein de l’église réformée. Martin Luther avait déclaré : «La musique est un don de Dieu. Elle ôte du cœur le poids du désespoir et la fascination des pensées mauvaises.» Son pouvoir bénéfique était accru par le fait que le choral était chanté par toute la congrégation qui s’unissait ainsi dans sa louange au Tout-Puissant. Il est révélateur que les chorals pour orgue aient figuré parmi les plus anciennes compositions de Bach. Il est tout aussi significatif qu’il les ait eus sur son lit de mort quand il aurait dédié «Devant ton Trône, je vais comparaître» à un de ses élèves. Bach écrivit quasiment une centaine de chorals réunis en différents recueils. Jacob Adlung, un organiste allemand de l’époque, décrivait les trois objectifs des chorals pour orgue de la manière suivante. Premièrement, donner à l’assemblée le ton du choral. Deuxièmement, lui rappeler la mélodie. Troisièmement, réjouir les fidèles grâce à des idées fluides («durch wohlfiessende Gedanken»). Sans aucun doute, Bach a nourri un intérêt particulier pour ce troisième aspect. Ce fut probablement ce qui offusqua les autorités ecclésiastiques d’Arnstadt où il avait trouvé son premier emploi de musicien professionnel, puisqu’ils le réprimandèrent pour «avoir fait de curieuses variationes sur le choral et y avoir mêlé d’étranges tonalités si bien que la Congrégation avait été déroutée». Mais Bach n’était pas un homme de compromis. Il partit chercher fortune dans une ville plus éclairée. Elle s’éveille et se lève rapidement. Sa lumière est intense, son étoile se lève. Seigneur Jésus, Fils de Dieu! Pour partager le dernier repas du Seigneur. De par leur nature même, les transcriptions sont souvent difficiles à exécuter. Pour celle-ci, le contre-chant doit être exécuté à la main droite par les doigts externes les plus faibles. Kempff parlait de l’importance d’un vrai legato (indispensable pour jouer Bach correctement). En fait, ce legato est tout aussi primordial pour bien exécuter ses transcriptions que les œuvres du «véritable» Bach. C’est l’Orgelbüchlein (Petit Livre d’orgue) qui se trouve être le recueil le plus célèbre de chorals pour orgue que Bach ait conçu, réunissant des œuvres probablement écrites à Weimar entre 1713 et 1716. A l’origine, il avait envisagé la composition de 164 pièces (il traça les portées sur 182 pages en y insérant les titres) dont seulement 45 furent achevées – on ignore exactement pourquoi. Avec ce recueil, Bach parvint à réaliser une nouvelle forme de choral où la mélodie était généralement dévolue à la partie supérieure, parfois sous une forme ornée, et où des motifs thématiques placés aux voix de l’accompagnement se trouvaient associés au contenu émotionnel et théologique du cantique. D’après la page de titre ajoutée ultérieurement, nous savons que Bach envisageait cette collection comme un matériau pédagogique insistant particulièrement sur le développement de la technique de la pédale. Pour cet enregistrement, j’ai choisi cinq chorals de l’Orgelbüchlein – qui sont tous de petits bijoux. Accorde-moi ta grâce en ce jour, ne me laisse pas tomber dans le découragement! Récitatif: Palès sera-t-elle la dernière à offrir un sacrifice? Non! Non! Je ne renoncerai pas à mes devoirs et tandis que tout le royaume résonnera de «Hourras», que mes beaux pâturages honorent avec moi le héros de Saxe et lui apportent joie et bonheur. Air: Les moutons peuvent paître en toute sécurité quand un bon berger veille sur eux. Là où le monarque règne bien, on peut ressentir sécurité et paix et toute chose qui rend le pays heureux. La cantate est orchestrée pour soprano, deux flûtes et continuo. Voici pour l’original. L’excellente transcription est du compositeur américain Mary Howe (1882–1964). Née à Richmond, en Virginie, elle a étudié le piano et la composition au Conservatoire Peabody de Baltimore et fut pendant une courte période des années 1930 élève de Nadia Boulanger à Paris. Elle fonda l’Orchestre Symphonique National de Washington D.C., puis avec Amy Beach, elle participa à la mise en place de la Société des Femmes compositeurs américaines en 1925. Cette pièce est un de mes rappels préférés. Quand je suis malade et triste. Quand mon cœur se brise. La capacité à traduire la spiritualité en éléments sonores par le truchement du piano est certainement nécessaire dans le cas présent – car une mélodie d’une telle renommée pourrait sonner banale et rabâchée à satiété. Outre l’enregistrement de Hess, d’autres pianistes illustres ont gravé cette transcription dont Lipatti et Gieseking tandis que Kempff enregistra son propre arrangement. Puisque tu nous délivres de l’angoisse et de la détresse. Comme dans chacune de mes trois transcriptions, j’ai suivi étroitement l’original, ne doublant simplement la partie dévolue au pédalier et déplaçant occasionnellement une voix vers une autre octave en cas de besoin. Ce choral est une arabesque – une mélodie fleurie, sereine qui après s’être cantonnée dans un ambitus relativement restreint, s’élance dans la pénultième phrase, offrant un miroir sonore aux mots «Nous t’invoquions, ô Dieu fidèle». L’accompagnement se réfère constamment aux premières quatre notes de la mélodie du cantique. Tu nous as protégés un si long temps et une si longue année. A cette époque , les Presses universitaires d’Oxford étaient en train de négocier avec moi un projet nouveau absolument passionnant. Plusieurs compositeurs au courant de ma dévotion toute particulière envers Bach, transcrivirent certaines de ses œuvres pour orgue, voix ou cordes afin que je puisse les jouer moi-même. L’un le dit à l’autre jusqu’à ce que finalement dix arrangements se trouvent être réunis. Les Presses d’Oxford eurent vent de ces «actes d’hommage» et décidèrent de les publier – si cela pouvait se faire. Elgar me dit qu’il ferait de son mieux pour en écrire une, mais rien ne se matérialisa. Holst ne parvint pas à trouver quelque chose qui lui convienne et dans tous les cas sentait qu’il ne pouvait aborder le piano. J’avais écrit à Vaughan Williams afin qu’il me transcrive quelque chose, lui offrant encore plus de baisers de ce que je lui devais déjà pour son Hymn-Tune. Il me répondit: «Comment puis-je dire ‘non’ – à l’idée d’une telle récompense si je dis ‘oui’? Je la réclamerai jusqu’au dernier carat (et le 1580ième)». Son arrangement et ceux de Bantock, Bax, Ireland, Bliss, Berners, Bridge, Howells, Goossens, Lambert, Walton et Whittaker arrivèrent finalement; l’affaire fut réglée en toute amitié et le titre de l’album arrêté – A Bach Book for Harriet Cohen. Ce recueil d’arrangements de la musique de Bach répond aux souhaits des adaptateurs qui désirent rendre hommage à l’exécutante qui a tant fait pour la cause de la musique britannique pour piano, tant solo qu’en concert, aussi bien ici qu’à l’étranger. Miss Cohen a, effectivement, donné les premières auditions d’œuvres de pas moins de sept compositeurs anglais présents dans cette compilation. Elle a toujours été une adepte férue de la musique de Bach (et pas uniquement de ses œuvres pour le clavier) et ses amis compositeurs ont considéré qu’un recueil comme celui-ci lui offrirait des versions accessibles pour le piano de certaines pages superbes composées originalement pour l’orgue, la voix ou quelque combinaison orchestrale. George Bernard Shaw, un ami intime d’Harriet Cohen, le surnomma «Five-finger Exercises for Harriet by Infatuated Celebrities» [Exercices de cinq doigts pour Harriet de la part de Célébrités entichées] (Cohen était en fait la maîtresse d’Arnold Bax). Toutes ces pièces ne témoignent pas d’un même niveau d’inspiration. Des douze originales, j’en ai retenu quatre. Alpha es et O ! (tu es l’Alpha et l’Oméga). En ce qui me concerne, le joyau de A Bach Book est la transcription qu’Herbert Howells (1892–1983) réalisa sur O Mensch, bewein dein Sünde gross, BWV622, un choral pour orgue écrit pour le temps de la Passion tiré du Petit Livre d’orgue. Une fois de plus, il suit étroitement l’original (j’ai repris certaines petites choses de celui-ci qui avaient été omises sans raison aucune) tout en parvenant à créer une œuvre pour piano totalement idiomatique de cet instrument quoique d’une réalisation ardue. Les marches harmoniques de Bach sont absolument saisissantes. En fait, toute personne peu familiarisée avec l’original pourrait imaginer entendre quelques ajouts du cru de Howells! Le texte (Sebald Heyden, 1525) est magnifiquement dépeint avec l’emploi presque ininterrompu d’un motif descendant de quatre notes (motif qui s’élève également) sous une mélodie solo élaborée. Il voulait être notre intercesseur. Le lourd fardeau de nos péchés. Il ne fait aucun doute que les amis et élèves de Bach ont considéré «Das alte Jahr vergangen ist» ou «O Mench, bewein’ dein’ Sünde gross» comme de superbes pages, mais je me fais fort de dire qu’ils ne pouvaient imaginer à quel point elles étaient merveilleuses n’ayant jamais écouté «Tristan», comme nous. Les développements de la musique poétique au cours du XIXe siècle dans l’opéra, dans le poème symphonique et dans la mélodie ont aiguisé notre appréciation de la poésie de Bach. Sur ce choral fut également élaborée une immense fantasia qui conclut la première partie de la Passion selon Saint-Matthieu (laquelle était tirée de la seconde version de la Passion selon Saint-Jean). La mélodie originale fut composée en 1525 par Mathias Greitter. Et nos pensées soient en toi. L’enregistrement laissé par Cohen de cette transcription révèle un énorme rallentando à la fin que j’ai quelque peu tempéré. Harold Bauer (1873–1951) vit le jour à Kingston-on-Thames, au sud de Londres. Ce fut par le violon qu’il aborda tout d’abord la musique avant de décider bien plus tard de se consacrer au piano (après s’être laissé persuadé par Paderewski qui faisait l’éloge de sa splendide sonorité et qui ajoutait «De plus, tu as de si beaux cheveux!»). En 1893, Harold Bauer partit pour Paris où il demeura vingt ans (et devint le dédicataire d’Ondine de Ravel). En 1900, il fit ses débuts aux Etats-Unis en donnant à Boston la première du Concerto no1 pour piano de Brahms avec l’Orchestre symphonique de Boston. Il fut considéré comme un des plus grands pianistes de son temps, un véritable successeur à Liszt, Paderewski et Brahms. Durant les années 1920, il donna à Londres plusieurs récitals de légende consacrés à Bach grâce auxquels il fit découvrir à un public nombreux la musique du maître allemand. Pour les Editions G Schirmer, il édita maintes partitions, dont plusieurs œuvres de Bach. Lorsque la terre recouvre ce corps. Puisque mon Jésus me réveillera. Dans le cas de la transcription de «O Mensch, bewein» de Howells les harmonies qui nous surprennent le plus sont réellement le fruit de l’imagination de Bach et non des additions modernes. La section centrale contrastante en majeur introduit un jeu en pizzicato aux cordes et le «glas funèbre» du texte. On perçoit plus précisément l’influence romantique de l’arrangement de Bauer dans le traitement du da capo où il réalise un pont véritablement brahmsien dans son caractère pour reprendre le début (puis coupe un passage de l’original). Personne ne peut cependant dénier qu’il ne capture à merveille la tristesse poignante de cet extraordinaire aria. Malheureusement j’ai étudié pendant une période considérable dans ce pays de brouillard, mais durant tout ce temps je n’ai absolument rien appris; et si j’y étais demeuré plus longtemps, je serais complètement allé à ma perte … ce n’est que depuis que j’ai quitté cette terre barbare que j’ai commencé à vivre. Et je vis maintenant uniquement pour l’unique, le vrai, le glorieux art allemand. Si sa vie fut tourmentée (il eut six épouses), sa carrière de pianiste virtuose se trouva écourtée du fait de son vif intérêt pour la composition. Sa transcription d’une des plus grandes œuvres pour orgue de Bach, la Passacaglia en ut mineur, BWV582 dénote quel flair il possédait au clavier et pourquoi Liszt le surnommait son «second Tausig» et «notre jeune lion». Il parvient néanmoins à rester remarquable­ment fidèle à l’original, même si ses fréquents changements de nuances et de tempos datent nettement de l’époque. Je trouve que ses articulations et son phrasé se voisinent étroitement mon impression de ce que Bach pouvait désirer. Et dans l’ensemble, le travail éditorial de l’œuvre demeure convaincant. J’ai changé quelques petites choses pour demeurer plus proche de Bach que d’Albert (à commencer par les trilles de la note aiguë par exemple!) mais il ne s’agit que d’ajustements mineurs. Voilà pour d’Albert. Que dit Bach dans cette pièce? Une passacaille est un ensemble de variations sur une basse obstinée (c’est-à-dire qu’elle se répète constamment). La première partie du thème exploité par Bach est empruntée à une passacaille d’un compositeur français, André Raison (1650–1720). Les vingt variations et fugue qui s’ensuivent sont groupées de manière à présenter des passages paroxysmiques de tensions et de détentes. On débat encore pour savoir si cette œuvre était ou non destinée à un clavecin à pédalier et deux claviers en place d’un orgue, ce qui est, je crois, plausible. De récents travaux musicologiques l’ont datée de la période où Bach séjourna à Arnstadt (1703–1707) alors qu’il était encore influencé par Buxtehude qu’il avait entendu jouer à Lübeck. La fugue n’est pas une entité indépendante mais une partie intégrante de la passacaglia, exploitant dans sa première partie le thème comme sujet avec un contre-sujet persistant qui ajoute grandement à l’apogée. Un heureux changement est apporté en entendant le thème de la passacaille énoncé dans des tonalités différentes au lieu de l’immuable tonique comme dans les variations. Au cours des quelques dernières lignes, la musique marque une courte pause sur un accord de sixte napolitaine (ré bémol majeur). Comme le souligne Peter Williams, «même une sixte napolitaine peut ne jamais sonner aussi bien qu’à la fin de cette fugue. En théorie l’effet est ordinaire, mais dans ce contexte, l’accord est magnifique». Je ne suis pas du tout surprise que d’Albert ait choisi de transcrire cette œuvre-là et je suis certaine qu’il possédait une puissance dramatique analogue. Am 11. März 1829 dirigierte der zwanzigjährige Felix Mendelssohn Johann Sebastian Bachs Matthäus-Passion in Berlin. Für diese erste Aufführung des Werks seit Bachs Tod neunund­siebzig Jahre zuvor hatte er mit dem 158 Sänger starken Chor und einem vollständigen modernen Orchester (das er, offenbar auswendig, vom Klavier aus leitete) gut ein Jahr lang geprobt. Der Saal der Berliner Singakademie war überfüllt, und seiner Schwester Fanny zufolge verlief das Ereignis in einer Atmosphäre ernster Andacht. Es war nach heutigen Maßstäben nicht gerade eine „authentische“ Aufführung, denn Mendelssohn kürzte erheblich, veränderte die Orchestrierung vieler Passagen und wechselte mehrere Solopartien aus, um Sänger von der Königlichen Oper einsetzen zu können. Doch niemand beschwerte sich darüber. Die Darbietung war für alle eine Offenbarung und löste das Versprechen des Chefredakteurs der Allgemeinen Musikalischen Zeitung A.B. Marx ein, daß sie die Tore eines lang verschlossenen Tempels öffnen werde. Das Ziel war nicht, sich so eng wie möglich an Bachs Intentionen zu halten, sondern seine Musik auf eine Weise zum Leben zu erwecken, die dem Publikum des neunzehnten Jahrhunderts verständlich war. Ebenso verfuhr Mendelssohn offenbar auch mit seiner Interpretation von Bachs Chromatischer Fantasie und Fuge, die er mit allen möglichen Crescendi, Piani und Fortissimi spielte, natürlich mit Pedal und Verdoppelung der Oktaven im Baß. Was Johann Sebastian wohl davon gehalten hätte? Die erwähnte Veranstaltung diente nicht nur als ungeheurer Anreiz für andere Aufführungen vorklassischer Musik (Brahms war insofern an dieser Wiederbelebung beteiligt, als er in Detmold und Wien große Mengen alter Chormusik dirigierte), sondern sie beeinflußte auch erheblich das Komponieren im neunzehnten Jahrhundert. Mendelssohn selbst schrieb sechs Präludien und Fugen für Klavier (op. 35), Schumann mehrere für Pedalklavier, Liszt komponierte seine Variationen über Bachs Weinen, Klagen, Sorgen, Zagen, Grieg schuf seine Suite „Aus Holbergs Zeit“, und so weiter. Komponierende Pianisten begannen Bachs Werke für den Eigengebrauch zu arrangieren und sie in ihre Konzertprogramme aufzunehmen (in erheblich größerem Maße als die Originalfassungen, die sie, wie Wanda Landowska meint, wohl ein wenig schmucklos fanden). Der erste und bedeutendste war Ferruccio Busoni (1866–1924), der acht Bände seiner eigenen Bach-Ausgabe veröffentlichte, darunter viele Transkriptionen, und Bach als das Fundament allen Klavierspiels ansah. Auch Franz Liszt transkribierte höchst effektvoll sechs der großen Orgelwerke. Wenn jemand Einspruch erhob, verteidigten Bezug nicht ganz klar sich damit, daß Bach und seine Zeitgenossen sich ununterbrochen gegenseitig ihre Musik Ausdruck und bestimmte Werke wiederverwendet hätten, wenn es ihnen paßte. Indem sie Musik der Vergangenheit den Massen näherbrachten, würden sie den Komponisten einen Gefallen tun, wenn auch auf ihre eigene Art. Nicht alle Komponisten waren jedoch damit einverstanden. Viel später hat Hindemith in seinem Buch A Composer’s World (1952, dt. : Komponist in seiner Welt, 1959) die Kunst der Transkription damit gleichgesetzt, daß man die Venus von Milo mit einem netten gemalten Rock und Jacke einkleidet. Doch auch heute noch, am Beginn des einundzwanzigsten Jahrhunderts und nach dem allumfassenden Revival alter Musik und dessen Fixierung auf „Authentizität“, ist es immer noch möglich, solche Transkriptionen vorzulegen und damit bei vielen Hörern Interesse an einem Werk zu wecken, das ihnen bislang unbekannt war (oder sogar ein allgemein bekanntes Stück in ganz anderem Licht zu zeigen). Man wird sie in Ehren halten, solange Berufs- und Amateurmusiker die Herausforderung schätzen, Stücke auf einem dafür eigentlich nicht vorgesehenen Instrument zu spielen (das sich im Falle von Bach und dem Klavier erheblich von dem Instrument unterscheidet, das der Komponist gekannt hat), um schlicht auf ihre Weise auszudrücken, wie schön, bewundernswert oder monumental ein bestimmtes Werk sein kann, und um ihre Begeisterung dafür anderen zu vermitteln. Das trifft auf die fünf Transkriptionen des deutschen Pianisten Wilhelm Kempff (1895–1991) zu, mit denen unsere Einspielung beginnt. In eine Organistenfamilie hineingeboren, begann er das „königliche Instrument“ zu spielen, ehe er noch die Pedale erreichen konnte, und mit zehn Jahren konnte er alle achtundvierzig Präludien und Fugen des Wohltemperierten Klaviers spielen und transponieren. Da sein Vater auch Chorleiter war, lernte er noch als Kind sämtliche Kantaten kennen und dirigierte später selbst viele davon. Die vorliegenden Bach-Transkriptionen stellte er in den Jahren zwischen 1910 und 1930 zusammen, überwiegend angeregt durch die Aufführungen, die Busoni in seiner Jugend in Berlin gegeben hatte. Kempff zufolge hatte Busoni einen durchgeistigten Klang, durch den sich die von Kempff selbst 1975 eingespielten Transkriptionen zweifellos auch auszeichnen. Für ihn war das Klavier sowohl Orgel als auch Orchester, und er vermochte Klänge zu erzeugen, die es mit beiden aufnehmen konnten. Dies kommt im einleitenden Stück, der Sinfonia in D-Dur aus der Ratwahlkantate, BWV29 (Wir danken dir, Gott, wir danken dir), wunderbar zum Ausdruck. Bach schrieb das Werk 1731 aus Anlaß der Wahlen zum Rat der Stadt Leipzig. Das Original ist ein brillanter Satz für Orgel und Orchester (samt Trompeten und Schlaginstrumenten), Bachs eigene Bearbeitung des ersten Satzes seiner Partita in E-Dur für unbegleitete Violine, BWV1006. Nachdem Kempff bei einem Berliner Konzert unter der Leitung des ebenfalls als Bachpianist berühmten Edwin Fischer den ursprünglichen obligaten Orgelpart auf dem Klavier gespielt hatte, entschloß er sich, in seiner eigenen Transkription den Orchesterklang zu reproduzieren. Das ist ihm mit Sicherheit gelungen! Kempff hat dem Stück die Vortragbezeichnung „Allegro pomposo“ gegeben und beim ersten großen Aufbau vor dem langen Decrescendo das Wort „glorioso“ eingefügt. Es blieb seine ganze Karriere lang eine seiner Lieblingszugaben. Die einzige Transkription der vorliegenden Aufnahme, die nicht auf eine Kantate oder ein Orgelwerk von Bach zurückgeht, ist das anrührende Siciliano in g-Moll. Es handelt sich dabei um den zweiten Satz der Sonate in Es-Dur für Flöte und Cembalo BWV1031 mit ihrem zarten und sehnsüchtigen Thema. Das Werk entstand vermutlich 1741 für die Konzerte des Leipziger Collegium Musicum, dem Bach vorstand. Kempffs Transkription ist Albert Schweitzer gewidmet, der ein bedeutender Bachbiograph und Organist, aber auch Theologe, Philosoph, Arzt und Missionar war. Im Zentrum von Bachs musikalischem Erbe stand der Choral – ein gemeinschaftlich gesungenes Glaubensbekenntnis, das im protestantischen Gottesdienst eine große Rolle spielte. Matin Luther verkündete dazu einmal: „… die Musik ist eine Gabe und Geschenk Gottes, nicht ein Menschengeschenk. Man vergisset dabei alles Zorns, Unkeuschheit, Hoffahrt und andere Laster.“ Die heilende Kraft des Chorals war um so größer, da es von der ganzen Gemeinde gesungen wurde, die zum Lob des Allmächtigen zusammenfand. Es ist bedeutsam, daß die Choralvorspiele für Orgel, die zu Bachs frühesten Kompositionen gehörten, ihn noch auf dem Totenbett begleiteten, als er angeblich einem Schüler „Vor deinen Thron tret ich hiermit“ diktierte. Er schrieb fast einhundert, von denen die meisten in verschiedenen Sammlungen zusammengefaßt sind. Jacob Adlung, ein deutscher Organist jener Zeit, hat die drei Zwecke des Choralvorspiels folgendermaßen beschrieben: 1) die Gemeinde auf die Tonart vorzubereiten, 2) sie über die Melodie aufzuklären, 3) sie „durch wohlfliessende Gedanken“ zu erfreuen. Bach war zweifellos vorwiegend an der dritten Möglichkeit interessiert. Das ist es auch, was die Kirchenvorstände in Arnstadt, seiner ersten Anstellung, nicht etwa erfreute, sondern so sehr ärgerte, daß sie ihm vorwarfen, er habe „in dem Choral viele wunderliche variationes gemacht, viele frembde Thone mit eingemischet, daß die Gemeinde drüber confundiret worden.“ Aber Bach ließ sich nicht so einfach Einhalt gebieten, sondern setzte sich ab in eine aufgeklärtere Stadt. Es liegt in der Natur der Transkription, daß sie häufig schwierig zu spielen ist, und die vorliegende verlangt, daß die Gegenmelodie von den äußeren, schwächeren Fingern der rechten Hand ausgeführt wird. Kempff sprach von der Notwendigkeit eines echten Legato (wie es für jegliches Bachspiel nötig ist), und es ist für seine Transkriptionen ebenso wichtig wie beim „wahren“ Bach. Die berühmteste Bachsche Sammlung von Orgelchoralvorspielen ist das Orgelbüchlein, das er vermutlich zwischen 1713 und 1716 in Weimar zusammengestellt hat. Für den ursprünglich auf hundertvierundsechzig Stücke angelegten Band (er begann damit, daß er hundertzweiundachtzig Seiten linierte und die Titel einfügte) stellte er nur fünfundvierzig fertig – warum, wissen wir nicht genau. Was Bach mit dieser Sammlung gelang, war jedoch eine neue Form des Choralvorspiels, dessen Melodie gewöhnlich in der Oberstimme und „meistens“ wäre eleganter und eindeutiger verziert gespielt wurde, während sich die thematischen Motive der Begleitstimmen auf die eine oder andere Art auf den emotionalen oder theologischen Gehalt bezogen. Wir wissen von einem Titelblatt, das Bach später hinzugefügt hat, daß sie auch als Lehrmaterial gedacht waren, insbesondere zur Entwicklung der Pedaltechnik. Für diese Aufnahme habe ich fünf der Choralvorspiele aus dem Orgelbüchlein ausgewählt – Glanzstücke samt und sonders. Rezitativ: Soll denn der Pales Opfer hier das letzte sein? Nein! Nein! Ich will die Pflicht auch niederlegen, Und da das ganze Land von Vivat schallt, Auch dieses schöne Feld Zu Ehren unsrem Sachsenheld Zur Freud und Lust bewegen. Arie: Schafe können sicher weiden, Wo ein guter Hirte wacht. Wo Regenten wohl regieren, Kann man Ruh und Friede spüren Und was Länder glücklich macht. Die Besetzung beläuft sich auf Sopranstimme, zwei Flöten und Continuo. So weit das Original. Die ausgezeichnete Transkription stammt von der amerikanischen Komponistin Mary Howe (1882–1964). Geboren in Richmond im US-Staat Virginia, studierte sie Klavier und Komposition am Peabody-Konservatorium in Baltimore und hielt sich in den 1930er Jahren kurze Zeit bei Nadia Boulanger in Paris auf. Sie gehörte zu den Gründern des National Symphony Orchestra in Washington D.C. und trug gemeinsam mit Amy Beach dazu bei, 1925 die Society of American Women Composers ins Leben zu rufen. Dieses Stück zählt zu meinen Lieblingszugaben. Die Fähigkeit, sehr gewagte These, ist hier auf jeden Fall nötig – sonst würde eine so bekannte Melodie banal und abgedroschen wirken. Neben Myra Hess haben noch andere berühmte Pianisten diese Transkription aufgenommen, darunter Lipatti und Gieseking, während Kempff sein eigenes Arrangement eingespielt hat. Wie in meinen drei anderen Transkriptionen auch habe ich mich äußerst eng ans Original gehalten und lediglich den Pedalpart verdoppelt sowie bei Bedarf gelegentlich eine Stimme um eine Oktave verschoben. Dieses Choralvorspiel ist eine Arabeske – eine hochverzierte, ruhige Melodie, die anfangs in einem begrenzten Tonumfang verbleibt, um sich dann in der vorletzten Phrase in große Höhen aufzuschwingen, wenn sie die Worte „Dich anrufen, o treuer Gott“ umsetzt. Die Begleitung bezieht sich ständig auf die ersten vier Töne der Choralmelodie. Damals  verhandelte der Verlag Oxford University Press mit mir über ein aufregendes neues Projekt. Mehrere Komponisten, denen meine besondere Verehrung für Bach bekannt war, transkribierten einige seiner Werke für Orgel, Gesang oder Streicher so, daß ich sie alleine spielen konnte. Einer sagte es dem anderen weiter, bis ich etwa zehn Arrangements beisammen hatte. Oxford Press hörte von diesen „Akten der Huldigung“ und beschloß sie zu veröffentlichen – vorausgesetzt, daß ein so heikles Projekt zu realisieren war. Elgar sagte mir, er werde sein bestes tun, eine Bearbeitung beizusteuern, aber die kam schließlich nicht zustande. Holst konnte nichts finden, was er arrangieren wollte, und war überhaupt der Meinung, sich nicht an das Klavier heranwagen zu können. Ich hatte an Vaughan Williams geschrieben, er möge etwas für mich transkribieren und bot ihm dafür viele weitere Küsse, obwohl ich ihm schon für Hymn-Tune viele schuldete. Er antwortete: „Wie kann ich ‘nein’ sagen – wenn ein ‘ja’ mir eine solche Belohnung in Aussicht stellt? Ich werde sie voll (und bis zum 1580sten) in Anspruch nehmen.“ Sein Beitrag und die von Bax, Ireland, Bliss, Berners, Bridge, Howells, Goossens, Lambert, Walton und Whittaker trafen schließlich bei mir ein; alles wurde gütlich geregelt, und der Titel des Albums sollte lauten: A Bach Book for Harriet Cohen. Diese Zusammenstellung von Arrangements der Musik Bachs ist von den Bearbeitern als Huldigung an die Interpretin gedacht, die mehr als irgend jemand anders dazu beigetragen hat, das Ansehen der britischen Klavier- und Konzertmusik daheim und im Ausland zu fördern. Miss Cohen hat nämlich Uraufführungen von nicht weniger als sieben der englischen Komponisten besorgt, die an dieser Zusammenstellung beteiligt waren. Sie hat stets ausgeprägten Enthusiasmus für die Musik Bachs bewiesen (nicht nur für seine Klavier­werke) und die mit ihr befreundeten Komponisten waren der Meinung, daß eine Sammlung wie diese Gelegenheit böte, sie mit spielbereiten Klavierfassungen bestimmter erlesener Werke zu versorgen, die ursprünglich für Orgel, Gesang oder eine Kombination von Instrumenten gesetzt waren. George Bernard Shaw, ein enger Freund von Harriet Cohen, gab dem Band den Spitznamen „Fünffingerübungen für Harriet von vernarrten Berühmtheiten“ (Tatsache ist, daß sie die Geliebte von Arnold Bax war). Nicht alle Stücke sind gleichermaßen inspiriert. Von den ursprünglichen zwölf habe ich vier für meine Aufnahme ausgewählt. Die erste ist die von Lord Berners (1883 als Gerald Hugh Tyrwhitt-Wilson geboren, 1950 gestorben). Er war der Sohn eines Marineoffiziers, der 1909 bis 1920 im dipolamtischen Dienst tätig war. Da er Humor hatte und sowohl malte als auch komponierte, wurde er der englische Satie genannt. Sein Beitrag zum Bach-Heft ist eine Transkription des Orgelchoralvorspiels In dulci jubilo BWV729. Dabei handelt es sich nicht um das gleichnamige Stück aus dem Orgelbüchlein, sondern um ein eigenständiges Werk, das wahrscheinlich zu Bachs Weimarer Zeit komponiert wurde. Es zeugt von einem weiteren Verwendungszweck des Choralvorspiels: Der Organist extemporiert damit kurze Einschübe zwischen den Zeilen des Kirchenliedes. Es muß für die Gemeinde manchmal verwirrend gewesen sein, eine vertraute Weise in derart blumiger und brillanter Umsetzung wie hier zu hören! In den 1930er Jahren wurde das Stück von dem damaligen Orgelstipendiaten Douglas Guest am King’s College zu Cambridge als Nachspiel des berühmten Festival of Nine Lessons and Carols (Neun Lektionen und Lieder) eingeführt – eine Tradition, die heute noch Bestand hat. Lord Berners bastelt kaum am Original herum – lediglich zum Ausfüllen des Pedalparts werden ein paar Baßnoten hinzugefügt. Sowohl der Text als auch die Melodie stammen aus dem Mittelalter. Für mich ist das Juwel dieses Bach-Hefts Herbert Howells’ (1892–1983) Transkription von O Mensch, bewein dein Sünde gross BWV622, einem Orgelchoralvorspiel zur Passionszeit aus dem Orgelbüchlein. Auch er hält sich ausgesprochen eng ans Original (aus dem ich einiges hinzugefügt habe, das er unerklärlicherweise ausläßt), schafft jedoch damit ein Werk, das dem Klavier vollkommen angemessen, wenn auch nur schwer zufriedenstellend zu spielen ist. Bachs Harmoniefortschreitungen in diesem Stück sind verblüffend. In der Tat könnte jemand, der mit dem Original nicht vertraut ist, auf den Gedanken kommen, Howells habe eine Menge hinzugefügt! Der Text (von Sebald Heyden, 1525) wird mit dem fast durchgehenden Einsatz einer viertönigen absteigenden Figur (die auch aufsteigt) unter einer ausgefeilten Solomelodie großartig umgesetzt. Bachs Freunde und Schüler hielten „Das alte Jahr vergangen ist“ und „O Mench, bewein’ dein’ Sünde gross“ gewiß für großartige Schöpfungen, aber ich erkühne mich, zu sagen, daß sie im Vergleich zu uns, die wir den „Tristan“ erleben durften, keine rechte Vorstellung davon hatten, wie wunderbar sie wirklich waren. Die Entwicklungen der lyrischen Musik des neunzehnten Jahrhunderts, in der Oper, in der sinfonischen Dichtung und im Lied, haben unsere Sinne für die Lyrik Bachs geschärft. Dieser Choral wurde auch als Grundlage für eine umfangreiche Fantasie eingesetzt, die den ersten Teil der Matthäus-Passion beschließt (und zweiten Fassung der Johannes-Passion entnommen ist). Die Originalmelodie schrieb Mathias Greitter im Jahre 1525. Harriet Cohens Einspielung dieser Transkription enthält am Ende ein massives Rallentando, das ich ein wenig abgeschwächt habe. Harold Bauer (1873–1951) wurde im englischen Kingston-on-Thames geboren und erhielt seinen ersten Musikunterricht auf der Geige. Erst viel später entschloß er sich, aufs Klavier umzusatteln (nachdem Paderewski ihn überredet hatte, der seinen Wohlklang lobte und meinte: „Außerdem haben Sie so schönes Haar!“). 1893 ging er nach Paris, wo er zwanzig Jahre blieb (und Adressat der Widmung von Ravels Ondine wurde). Im Jahre 1900 gab er sein Amerikadebüt mit der Bostoner Erstaufführung des Ersten Klavierkonzerts von Brahms mit dem Boston Symphony Orchestra. Er galt als einer der bedeutendsten Pianisten seiner Epoche sowie als wahrer Erbe der Tradition von Liszt, Paderewski und Brahms. Seine legendären Bachrecitals in London in den 1920er Jahren brachten vielen Zuhörern die Musik des deutschen Meisters nahe. Für den Verlag G. Schirmer erstellte er zahlreiche Editionen, darunter mehrere mit Werken von Bach. Wie im Falle von Howells’ Transkription von „O Mensch, bewein“ sind die wirklich überraschenden Harmonien reinster Bach – keineswegs moderne Zusätze. Der kontrastierende Mittelteil in der Durtonart führt pizzicato geführte Streicher ein, sowie die „Sterbeglocken“ aus dem Text. Der Einfluß der Romantik ist am deutlichsten in Bauers Bearbeitung des da capo zu erkennen, wo er eine Überleitung von wahrhaft Brahms’schem Charakter zurück an den Anfang konstruiert (und dann eine Kürzung im Original vornimmt). Niemand kann jedoch behaupten, er hätte die ergreifende Traurigkeit dieser ungewöhnlichen Arie nicht wunderschön eingefangen. Eugen d’Albert (1864–1932) war ein weiterer Klaviervirtuose, der sich zur Musik Bachs hingezogen fühlte. Im schottischen Glasgow als Sohn eines französischen Vaters und einer deutschen Mutter geboren, studierte er kurzzeitig in London bei Sir Arthur Sullivan, fand dann aber seine geistige Heimat in Deutschland, wo er einer von Liszts brillantesten Schülern wurde. Tatsächlich mißfiel es ihm so sehr, als englischer Pianist bezeichnet zu werden, daß er 1884 schrieb, er habe zwar das Pech gehabt, einige Zeit dort im Land der Nebel zu studieren, habe aber absolut nichts gelernt und wäre bei noch längerem Aufenthalt gänzlich dem Ruin verfallen. Erst seit dem Verlassen jenes barbarische Landes habe er zu leben begonnen, und zwar nur für die einzigartige, glorreiche deutsche Kunst. Sein Leben nahm einen stürmischen Verlauf (mit sechs Ehefrauen), und seine Karriere als Virtuose war kurz, da er sich mehr fürs Komponieren interessierte. Seine Transkription von einem der größten Orgelwerke Bachs, der Passacaglia in c-Moll BWV582, zeugt davon, welches Flair er am Klavier besessen haben muß und warum Liszt ihn einen „zweiten Tausig“ oder „unseren jungen Löwen“ genannt hat. Dennoch gelingt es ihm, sich bemerkenswert eng ans Original zu halten, auch wenn seine häufigen Dynamik- und Tempowechsel ganz ihrer Zeit verpflichtet sind. Ich finde, daß seine Artikulation und Phrasierung dem nahekommen, was Bach meiner Vorstellung nach gewollt hätte, und wie er das Werk insgesamt „redigiert“ hat, erscheint mir ausgesprochen überzeugend. Ich habe einige Stellen verändert, um Bach näher zu sein als d’Albert (zum Beispiel, indem ich die Triller von der höheren Note her ansetze! ), aber das sind Kleinigkeiten. So viel zu d’Albert. Aber was will Bach mit diesem Stück aussagen? Eine Passacaglia ist eine Folge von Variationen über einen (ständig wiederholten) ostinaten Baß. Die erste Hälfte des Themas, das Bach hier verwendet, ist einer Passacaglia des französischen Komponisten André Raison (1650–1720) entnommen. Die zwanzig Variationen und die Fuge, die darauf folgen, sind so angeordnet, daß sich Passagen maximaler Spannung und Entspannung ergeben. Es wird viel darüber diskutiert, ob das Werk ursprünglich für zweimanualiges Pedalcembalo statt für Orgel gedacht war, was mir durchaus plausibel erscheint. Neuere Untersuchungen datieren die Komposition außerdem auf Bachs Zeit in Arnstadt (1703–1707), als er eindeutig von dem Erlebnis beeinflußt war, Buxtehude in Lübeck gehört zu haben. Die Fuge steht nicht für sich, sondern ist integraler Bestandteil der Passacaglia; sie verwendet den ersten Teil des Themas als Subjekt sowie ein hartnäckiges Kontrasubjekt, das erheblich zum Aufbau der Erregung beiträgt. Es ist erfrischend, das Thema der Passacaglia in verschiedenen Tonarten hervortreten zu hören anstatt immer aufs neue in der Tonika, wie es in den Variationen der Fall war. In den letzten Zeilen verharrt die Musik kurz auf einer neapolitanischen Sext (Des-Dur). Peter Williams sagt dazu: „Selbst ein neapolitanischer Sextakkord kann eigentlich nicht so gut klingen, wie er es am Ende dieser Fuge tut; theoretisch ist der Effekt nichts besonderes, aber in diesem Kontext ist der Akkord prachtvoll.“ Es überrascht mich nicht, das sich d’Albert entschloß, gerade dieses Werk zu transkribieren, denn ich bin sicher, daß er über die entsprechende Dramatik und Kraft verfügte.